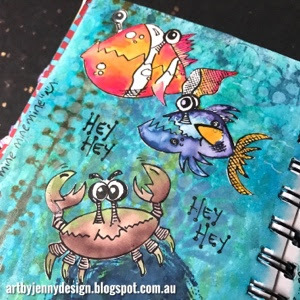 This is what happens when Dylusions' Under the Sea critters meet the theme "movie quote". 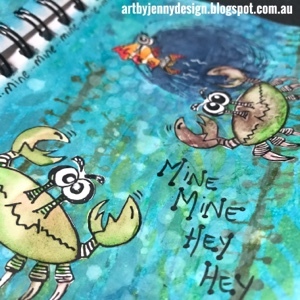 I know its the seaguls that are famous for the quote "mine mine mine..." but I'm sure the little crabs said it too! As well as "hey hey" :) lol Will just have to watch the movie again! 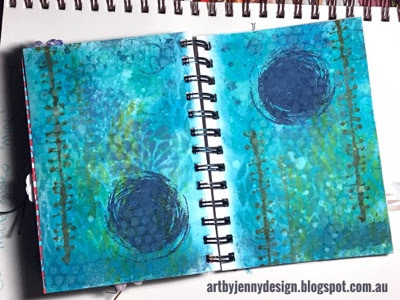 The background was made using Distress Ink Sprays (Dylusions Ink Sprays and watercolours can also be used) then stamped with the long spotty (used as seaweed here) Stampers Anonymous Classic Borders and IndigoBlu Ink Splats stamps. I also stamped Darkroom Door Polka Dots background stamp with water, not that it showed very well. Looks fine in the photo! More layers were added using Tim Holtz layering stencils (Splash, Bubbles) with Distress Inks in Picket Fence (white), Faded Jeans and Mustard Seed. 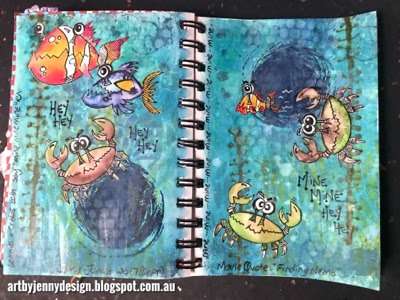 Using Yasutomo Mineral Multi (Mixed) Media Paper and Archival black ink, I stamped the crabs and fish from Dyan Reaveley's groovy stamp set. I coloured them with Jane Davenport Mermaid Markers. 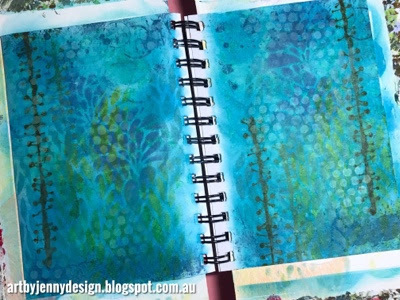 This unique paper doesn't soak up the ink, but lets it sit on the surface allowing the colours to blend beautifully as it dries. 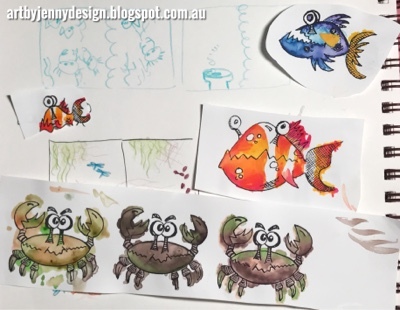 Too much water and ink creates a bit of a mess (as you can see with the crabs) but that doesn't matter when they're being cut out. Cutting the Mineral Paper was different to other mixed media paper. Made from rocks instead of cotton or trees, its a paper similar to Yupo but thinner/lighter, and is so smooth the scissors glide through easily, hardly any friction at all. I used the Kuretake Hikkei Brush Pen (black marker) for extra details on the fish and crabs, as well as the words. I also used my white Sharpie for the eye highlights. It was alot of fun using these critters... they always make me smile! Thanks for visiting my blog. Have a happy day! 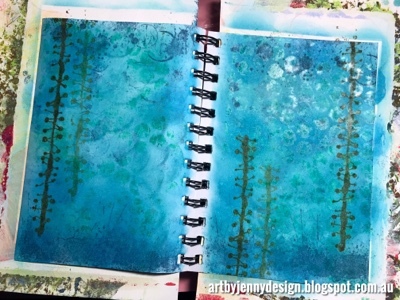 The following are a few treasures used in the creation of this art journal page.